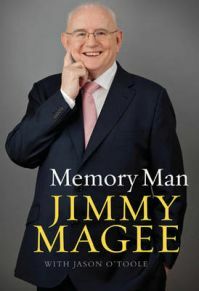 Jimmy Magee, whose extraordinary memory for sports trivia has led to his being dubbed the Memory Man, has the distinction of being the longest-serving sports commentator in the English-speaking world. He started his career in 1956, the year that Ronnie Delany won the 1,500 metres gold medal at Melbourne. He has covered every Olympic Games since 1972 (the London 2012 games were his eleventh!) and every soccer World Cup since 1974. He achieved worldwide notice in Munich in 1972 when he managed to breach security in the Olympic village to cover the terrorist attack on Israeli athletes. This incredible scoop was picked up by CBS in the United States and then by every television station around the world. Jimmy Magee has been present at the most iconic sporting moments in both world and Irish sport and gives his unique insight into these major sporting moments. He tells how he played five-a-side football with Gert Muller, how he almost came to blows with Nigel Benn, and why he thinks Katie Taylor is Ireland's greatest contemporary sportsperson. But what is perhaps the most striking aspect of such an accomplished career is how Jimmy managed to find the strength to keep up his cheerful persona on air as he endured immeasurable sorrow in his personal life. His beloved wife, Marie, died unexpectedly in 1989 and his son Paul, himself a footballer and sports broadcaster, tragically lost his battle with motor neurone disease in 2008 at the early age of fifty-one. Full of anecdotes, humour and poignancy, Memory Man tells all these things and more. This is a frank, open and honest book by one of Ireland's most beloved national treasures. Jimmy Magee is an institution in Irish broadcasting life. He was born in New York in 1935. Three years later the family returned to Ireland and settled in the Cooley Peninsula in Co. Louth. Jimmy's early working experiences were in a pharmacy in Carlingford and as a railway clerk in Greenore. But his dream was always to work in radio, and by 1957 he managed to fulfil that dream. His varied and much-travelled life, as it evolved, is told in this memoir, including his 11 Olympic Games, 12 FIFA World Cups, 29 European Cup finals, 11 athletics world championships, 30 world title fights and 10 Tours de France. Jason O'Toole is a well-known journalist, celebrated for his interviews. He is joint author of The End of the Party (with Bruce Arnold) as well as a biography of Brian Cowen.